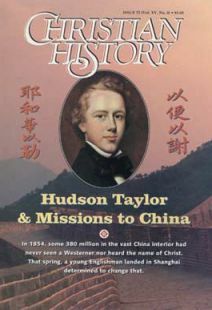 THERE ARE probably more books on Hudson Taylor, and his China Inland Mission, than on any other missionary since the apostle Paul and perhaps Francis Xavier, the 16th-century Jesuit missionary to Japan. Just in the Princeton Seminary library, which I regularly use, I counted some 54 titles. In the case of books out-of-print or republished many times, only the date of the original edition is given. The single most indispensable and easily available work is A. J. Broomhall’s seven-volume paperback Hudson Taylor & China’s Open Century (Hodder & Stoughton and OMF, 1981–89). For those not quite ready for seven volumes, read the older standard 2-volume work, Hudson Taylor in Early Years and Hudson Taylor and the China Inland Mission (in many editions), both by Dr. and Mrs. Howard Taylor. Also see the fine short history of the mission by Leslie T Lyall, A Passion for the Impossible: the China Inland Mission 1865–1965 (Moody, 1965). Anyone concerned that mission history neglects the major role that women have played should read Hudson Taylor and Maria by John Charles Pollack (1962). On the forced transition of the mission from its base in China to “mission to the world,” see The Fire Burns On: A C.I.M. Anthology (1965), edited by Frank Houghton, and Phyllis Thompson’sChina: The Reluctant Exodus (1979). Martyred Missionaries of the China Inland Mission, edited by Marshall Broomhall (1901), focuses especially on the Boxer Rebellion. One of the most poignant stories of martyrdom, however, is Not Worthy to Be Compared: The Story of John and Betty Stam and the Miracle Baby by E. H. Hamilton (1936). For the larger picture of China missions, the standard work, though now more than 60 years old, is still Kenneth Scott Latourette’s A History of Christian Missions in China (1929). For a delightfully readable paperback updating the record, see G. Thompson Brown’s Christianity in the People’s Republic of China (John Knox, 1986). For those who want the story of Christianity in China stretched back to its beginnings, read my A History of Christianity in Asia, Vol. 1, Beginnings to 1550 (Harper-Collins, 1992), especially chapters 15, 18, 20, and 21. Check the author blurbs at the end of this issue’s articles for other suggested readings. Samuel Moffett is Henry Luce professor emeritus of missions and economics at Princeton Theological Seminary, New Jersey.